Ahhhhhhh! It’s been a while since one felt that stab in the heart while watching a love story trot towards its somber culmination. Love’s like that. When put on film it can make you fall in love with the emotion called love, as it happened in Imtiaz Ali’s Jab We Met. We’ll never know why Imtiaz didn’t cast Ayesha Takia in Jab We Met after she sparkled in Ali’s Socha Na Tha. But there’s Kukunoor who truly values in Takia’s talent. She brings to this film about that silly thing called, a kind of inner conviction that makes you want to believe in her faith in the oft-abused emotion. When Ayesha speaks her lines they don’t sound written in this under-written film about love that has goes into the realm of the surreal. Ouch! Happily for us and the film, such insensitive moments are too far and in-between to make a difference to the gentle tale of a girl who runs a watch repair-shop in town where time has nearly stopped still. Nagesh Kukunoor and his lovely leading lady are most comfortable with the silences that punctuate life away from the city. The camerawork by Chirantan Das shamelessly creates picture-postcard images all around Aranya’s life and world. The relationships that emerge from the sedate silences of a life lived in an ageless vacuum are woven into a plot which careens between being a fragile fable and a mawkish melodrama. Caught in that morning-time dim dawn sun when the world looks irresistibly innocent and shorn of corruptibility the goings-on in Mod are so evocative of an era that never existed outside the poet’s imagination that we tend to forgive the plotting excesses that mar the second-half of the film. The finale on the hilly railway station, however, erases the clumsiness of some of the proceedings in the second-hour. And what we are left with is a film of heart-aching beauty, soo tender and evocative that in terms of manmade craft it replicates the intrictate threadwork of a Kashmiri carpet where very often the design is so nuanced the naked eye can’t see the craftsmanship. The film has some truly tender supporting performances from Raghuvir Yadav (playing a zany Kishore Kumar fan), Tanve Azmi (always capable of tremendous empathy) and specially Nikhil Ratnaparkhi as Takia’s overweight suitor who in that one sequence where he pleads and threatens Ayesha Takia to marry him, brings so much bridled emotion into the film you are left feeling satiated with the vast amount of talent that this delicately drawn fable-romance pitches forward. Ayesha Takia Azmi of course presides over the subtle proceedings. With her effortlessly-drawn emotions she is a treat to watch in every frame. 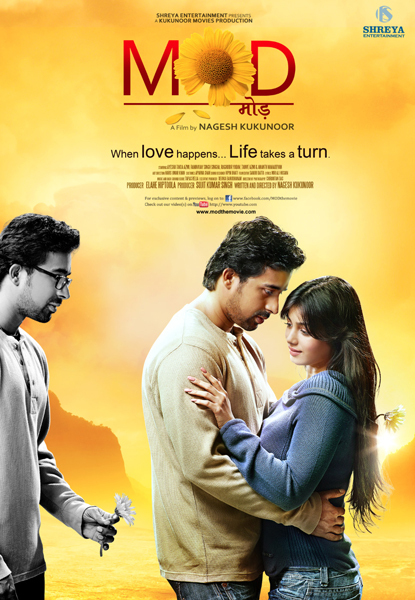 Rannvijay Singh in a complex role that demands various mood swings from the actor, is surprisingly in-charge. Mod is like a gente sonnet played on a cosy winter morning. It is the tenderest love story in ages with a central performance by Takia that strikes a chord deep in your heart. Mod is a film you want to adopt embrace and hold close to your heart.